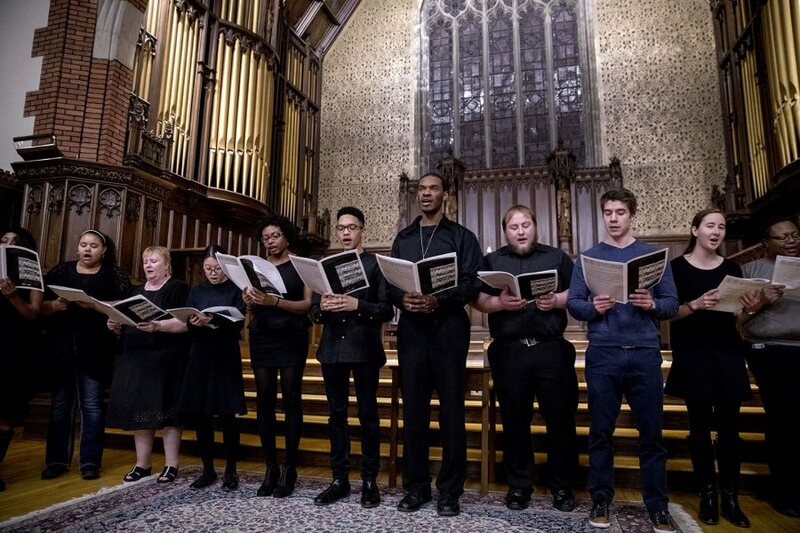 From Sunday evening’s interfaith service to Tuesday’s MLK Day Read-In at a local elementary school, immerse yourself in the images, ideas, and rhetoric of the Martin Luther King Jr. Day celebration at Bates. On Sunday evening, the Gospelaires a cappella group performs at the start of the Rev. Dr. Martin Luther King Jr. Interfaith Service in the Gomes Chapel. The Rev. Dr. Charles Howard, university chaplain at the University of Pennsylvania, delivers the sermon. He told a story about meeting the late Peter Gomes ’65, for whom the Bates chapel was named in 2012. In other words, as Howard told the gathering in Gomes Chapel, “there is something bigger on our side that won’t let us lose” in the work for social justice and fairness. 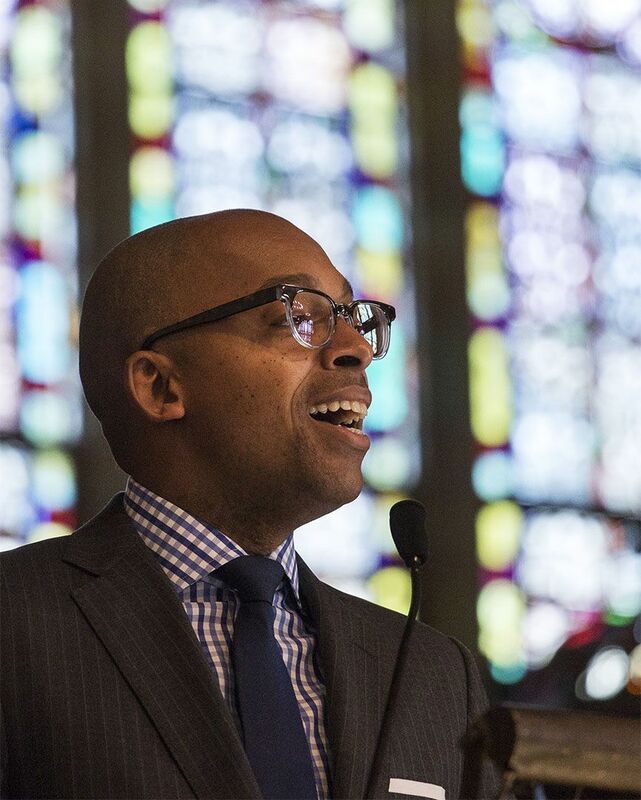 Monday morning, a standing-room only crowd gathers in the Chapel to hear historian Khalil Gibran Muhammad deliver the MLK Day keynote. 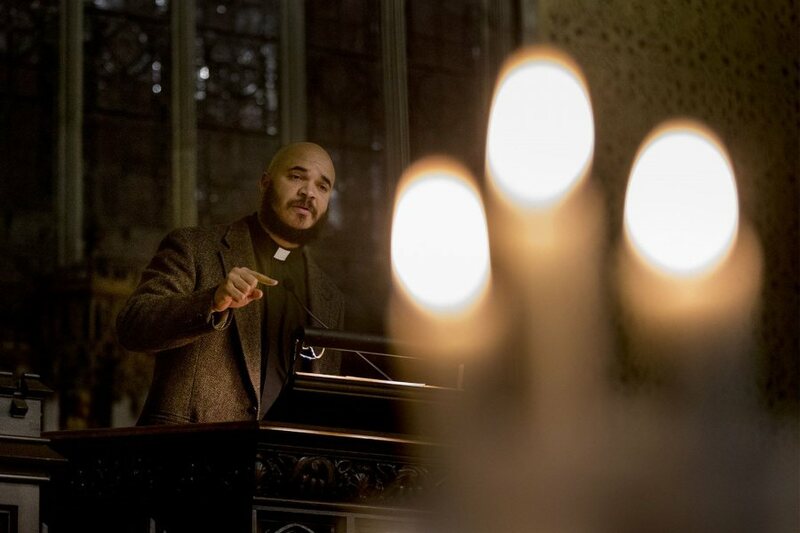 Muhammad reminded his Bates audience that understanding America’s history of racial injustice is the first step toward redressing that injustice. “Since it is not OK to teach our children to deny the Jewish Holocaust, then why is it OK in far too many schools and homes to deny the centrality of slavery to the American story?” he wondered. Too often we treat history like it is an opinion. I’ve served on national and local committees to solve this problem or that, and I’ve watched educated people invoke their own experiences as historical proof. We all have opinions, but we are not all historically literate, never mind fluent. The same problem of climate change denial holds in how most Americans think about our past — we at least give economists and environmentalists a chance to shake our beliefs. Historians, not so much. 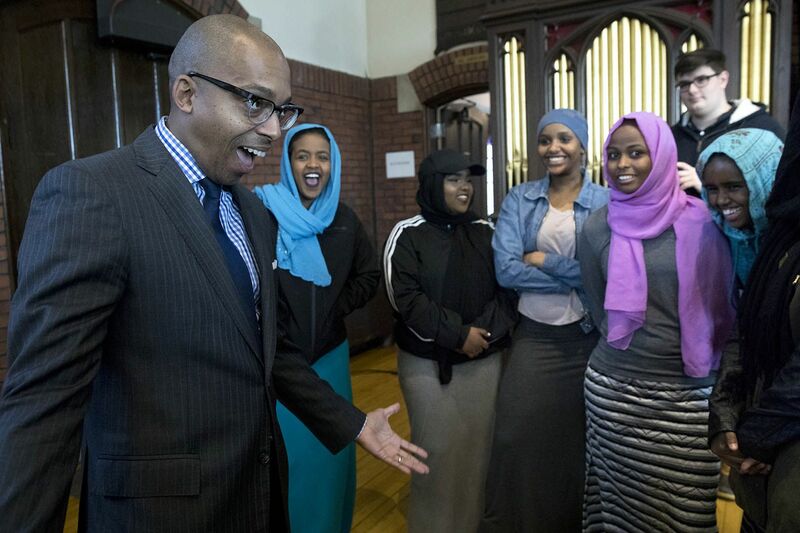 After his talk, Muhammad greets Lewiston High School students who are members of the 21st Century Leadership Program. Another stunning point made by Muhammad was that, in a sense, the Obama presidency closed the book on civil-rights era notions of progress. The half-century-old rules and standard operating procedures for racial advancement are now obsolete. There is no racial barrier left to be broken. There is no office in the land blacks first can ascend — from mayors to governors to attorney generals, and now the presidency — that will serve as a magical platform for saving black or brown people and the soul of a nation from its racist past. America’s institutions cannot be made over by simply dressing them up in more shades of brown and expecting a more just and equitable outcome. In this new era, the structures and the values of our institutions are the challenges we must now unflinchingly confront. Different day, same old ripoff. 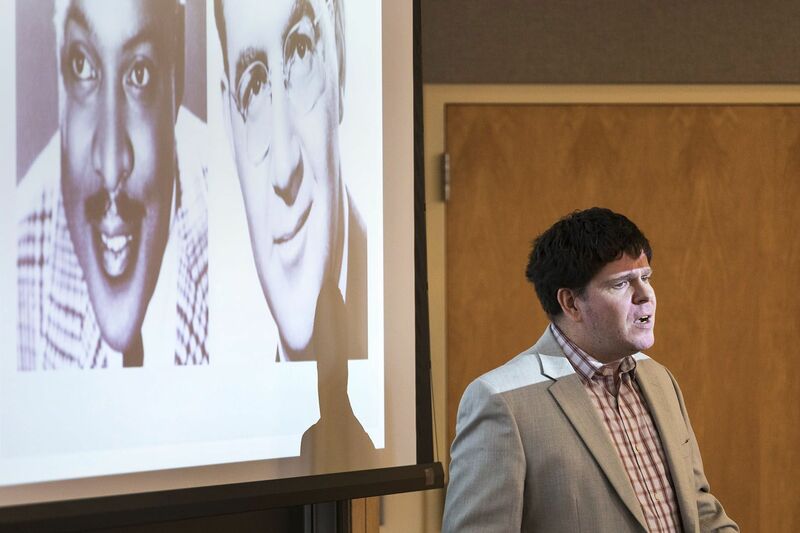 The music industry’s longstanding agility in stealing from black artists was the topic of “A Cultural Debt,” led by Associate Professor of Music Dale Chapman, seen here speaking in front of a projected image of Count Basie and Benny Goodman. It’s a sorry story that begins as far back as the 1840s and the minstrel shows in which white performers in blackface parodied African American performance. Citing Eric Lott’s 1993 study Love & Theft: Blackface Minstrelsy and the American Working Class, Chapman pointed out that the minstrel shows constituted a kind of “politics of ridicule” that helped white working-class Americans keep black culture in its place. White jazz musicians like Paul Whiteman aimed to “make a lady” out of black jazz for white audiences. Sun Records owner Sam Phillips, through white artists like Elvis Presley, took the other route and cashed in by bottling the vitality of black music for mainstream consumption. Labels like Atlantic cheated African American hitmakers out of revenues from the sales and publishing of their music — but when rappers found success decades later by sampling older recordings, the industry turned the tables, so to speak, and hauled them into court for theft of intellectual property. As the people in the classroom sang jazz riffs, tapped toes to Benny Goodman, and swayed heads to Ruth Brown, it was a living demonstration that the thieves at least had good taste. 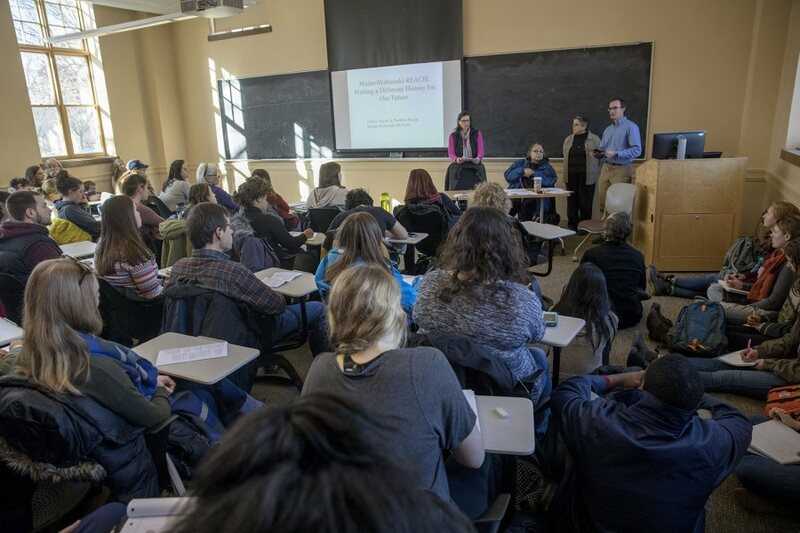 In a full Hedge Hall classroom, Associate Professor of History Joe Hall (right) introduces, from left, Esther Attean, Kathy Paul, and Penthea Burns, women at the forefront of efforts in Maine to confront, expose, and help to heal the harm done to Native American children by the state’s child welfare system. Since the 1800s, one thread of the narrative tried to persuade Maine’s Native Americans that they were poor parents. Why else would the children of Maine’s four Wabanaki tribes — the Passamaquoddy, Penobscot, Micmac, and Maliseet — be taken into foster care at rates far higher than non-Native children? Attean and Burns spoke from their perspectives as co-directors of Maine-Wabanaki REACH, a program that grew out of the Truth and Reconciliation Commission’s work and now devotes itself to reconciliation, engagement, advocacy, change, and healing for Maine’s Wabanaki citizens, who number 8,000 today. Joining Attean and Burns was Kathy Paul, a Penobscot elder. “We realized there was not a possibility of going forward until there was a common understanding of what had happened,” she said. Back in 1978, the federal Indian Child Welfare Act was supposed to end the disproportionate rates at which states were removing Native American children from their traditional homes. But years later in Maine, well-intentioned new policies and improved training still hadn’t gotten to the root of the problem: a racist culture within the state child-welfare establishment was “alive and well,” said Burns, but “never talked about” publicly. In large part due to Attean and Burns’ advocacy, Maine established the landmark Truth and Reconciliation Commission, the first of its kind in the U.S. to address Native child welfare. Thanks to the commission’s work and other efforts, racist narratives against the Wabanaki are slowly being dismantled. “It’s liberating to know that there’s nothing wrong with us,” Attean said. Screened during the session, this film documents the work of the Welfare Truth and Reconciliation Commission. 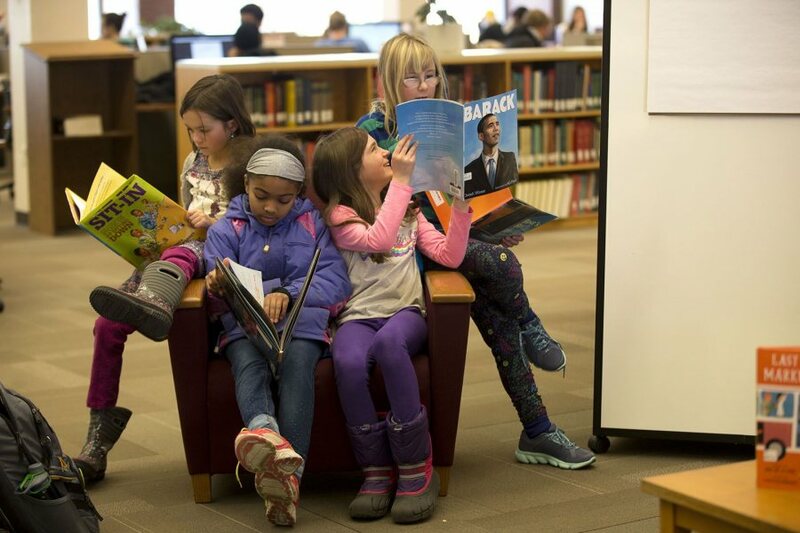 In Ladd Library, children read books from the college’s Picture Book Project. Founded by children’s book creator Anne Sibley O’Brien and Associate Professor of Psychology Krista Aronson, the Picture Book Project comprises books, published since 2002, featuring racially diverse characters. Numbering 1,500 titles, “it is the only circulating library collection of its kind,” said Aronson. At the start of the session, O’Brien read from Last Stop on Market Street, a 2016 Newbery Medal–winning book by Matt de la Peña. As she read, the children listened for how the main character, an African American grandmother, acted as a “hero,” teaching her grandson how to see beauty in people and in the world that others might easily dismiss. Then, the children chose and read stories from the collection. Afterwards, they drew pictures of themselves as a “hero” taking action with the characters in their story. Joining Fakorede were, from left, Peter Lasagna, head coach of men’s lacrosse; Erica Rand, Whitehouse Professor of Art and Visual Culture; Gwen Lexow, Title IX officer; and Ameer Loggins, who is pursuing his doctorate in African diaspora studies at Berkeley. The panel looked at how NCAA Division I athletes — especially football and basketball players, who are mostly African American — generate billions in revenue for their institutions, yet see little of it. Panelists use the words “plantation” and “sharecropper” to describe the oppressive place of athletes in the Division I money machine. 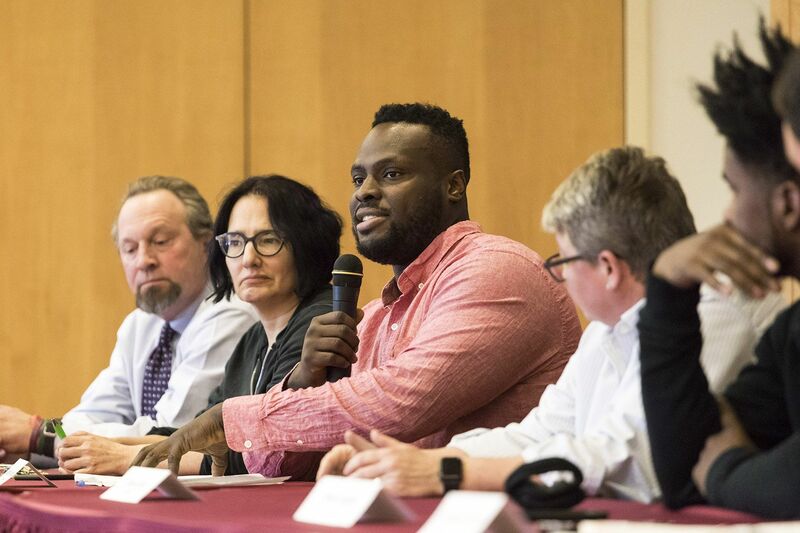 For many Division I athletes, academics often take a back seat, a fact not lost on Fakorede, an All-American thrower for Bates track and field and president of Bates Student Government. At Bates, “I can focus on my course load and still perform at a high level athletically,” he said. “My dad always instilled in me the importance of the brain. He’d say that your body gets old and wears out but you can always pick up a book,” Fakorede said. Organizers Allen Kendunga ’18 (standing) of Kigali, Rwanda, and Andrew Segal ’17 (left) of Glencoe, Ill., joined by Admission counselor Matt Williams (right), listen to a discussion during their session looking at Bates’ future through the lens of its past. During Kendunga and Segal’s session, the institutional character in question was Bates’. While Bates was indeed founded by a radical abolitionist, Oren Cheney, it also benefited from slavery, said Segal, a religious studies major from Glencoe, Ill., because textile mill owner Benjamin Bates, for whom Bates is named, undoubtedly profited from Southern cotton. After that history lesson, the organizers asked their audience a more forward-looking question about Bates’ character. 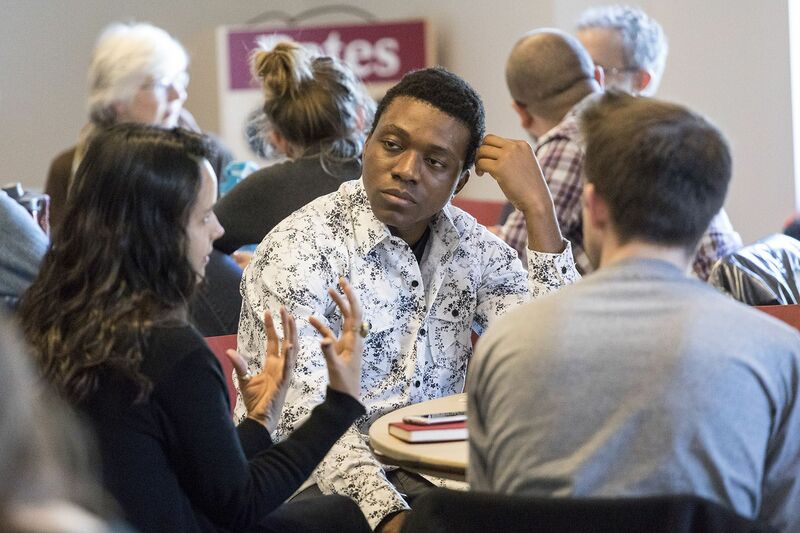 If Bates in 1855 was a century ahead of its peers by being open to men and women and to all religions and races, what should Bates do today to stay ahead of its peers? The audience offered ideas ranging from a required social-justice course and increased financial aid to stepped-up sustainability programs. Having a progressive history doesn’t give Bates a lifetime pass, said Annakay Wright ’17, a women and gender studies major from Brooklyn, N.Y.
“Just because you have an alumnus like Benjamin Mays,” the great civil rights leader and 1920 Bates alumnus, “doesn’t make Bates like Benjamin Mays. Students have to participate” to effect institutional change. Gideon Ikpekaogu ‘17 of Lagos, Nigeria, engages in a key aspect of MLK Day: listening. Ikpekaogu and fellow students of Professor of Latin American Studies Baltasar Fra-Molinero presented findings from their coursework about the division of race, socioeconomic status, drugs, land, and access to natural resources in Colombia. As the gathering broke into discussion groups, Ikpekaogu encouraged his group to strive for self-awareness. Bani-Adam heard some of those stories while living in Kenya’s huge Dadaab refugee camp, whose threatened closure this year would send nearly 300,000 residents back to chaos in Somalia. In a packed classroom, the soft-spoken Bani-Adam described his journey and philosophy — and he played his oud and sang, supported on percussion by Ness Smith-Davidoff and on viola by session host and faculty member Greg Boardman. Bani-Adam’s songs professed affection for “Mama Africa” and lamented lovers separated when they left Dabaab. In “I Am Somali,” quick shifts among languages showed that Somali identity transcends national boundaries. Living in the U.S. since 2016, Bani-Adam continues the peace activism that he brought from Somalia to Dabaab. A devout Muslim, he believes that people of faith who understand other religions are less susceptible to devils quoting scripture. 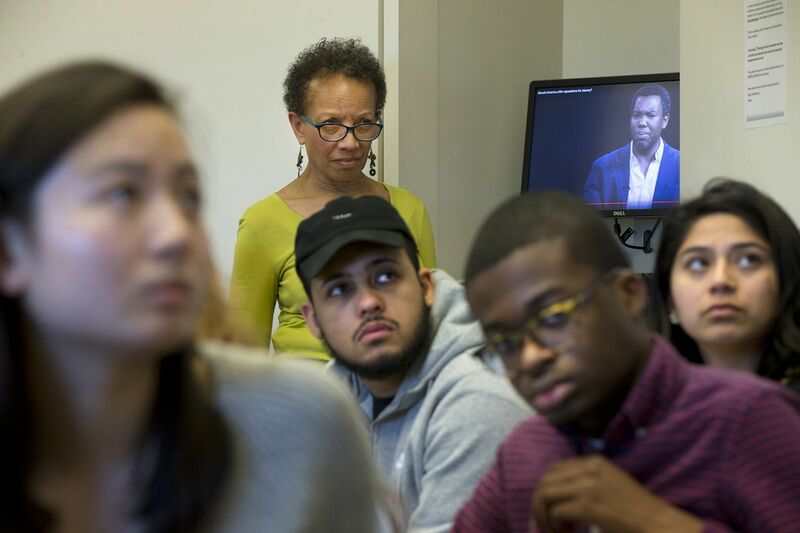 Associate Professor of Politics Leslie Hill watches a video interview with author Ta-Nehisi Coates, seen on the monitor. The session, co-organized by Hill, Associate Professor of Philosophy Susan Stark, and students, examined Coates’ 2014 article on reparations in The Atlantic. 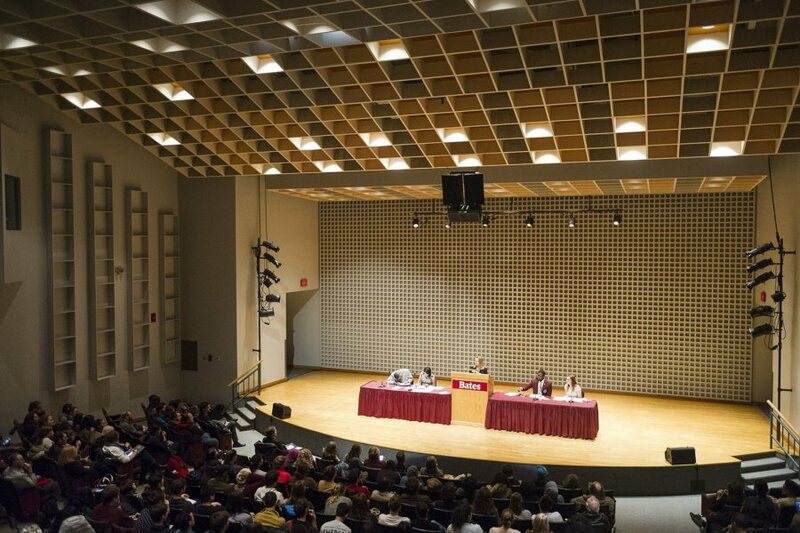 At the podium, Director of Debate Jan Hovden greets a packed Olin Arts Center Concert Hall for the annual Benjamin Elijah Mays Class of 1920 Debate, featuring debaters from Bates and Morehouse colleges. This year, the debaters took on a topic that’s older than the New Deal. That is, should we trust government programs to repair social ills? Or, in the context of reparations, should the government instead put money directly into the pockets of those who’ve been wronged? Tessa Holtzman ’17 of Bates, a politics major from Las Cruces, N.M., outlined the Government’s case to support “rectifying current inequalities” through targeted federal programs and government spending. Not so fast, said Morehouse junior Mati Baker, an African American studies major from Baltimore. A utilitarian framework, he said, is “one that benefits the many with the least detriment to the few.” That’s the “same ideology that has enabled the majority to continue to promote policies that maintain white privilege. 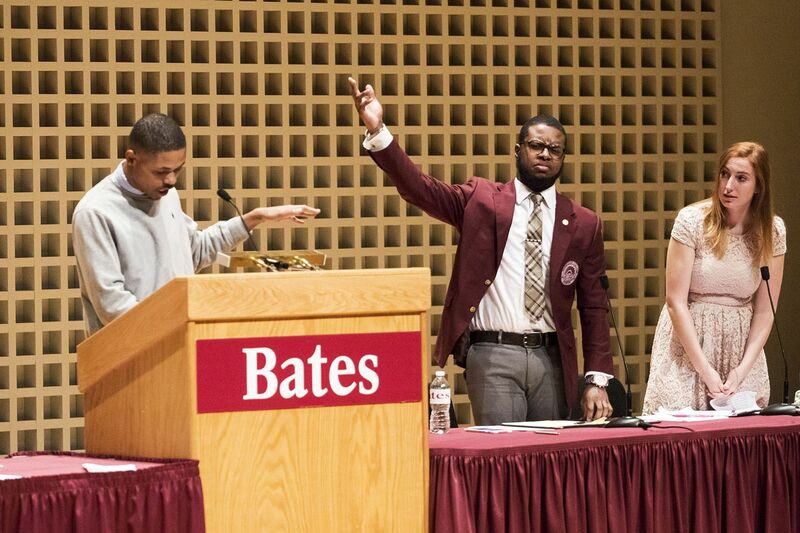 Morehouse debater Sha’Heed Brooks, at the lectern, waves off a point-of-information request from Baker of Morehouse and Zoë Seaman-Grant ’17 of Bates. Brooks, a sophomore philosophy major from Fayetteville, N.C., went on the offensive, attacking the Opposition’s case for reparations. Furthermore, he added, “their side never deals with mass incarceration. Their side never deals with police brutality in a way that we can only get when we focus on current inequalities that individuals face” through targeted federal programs. Seaman-Grant took to the lectern to explain that reparations would, indeed, stop the cycle of oppression. The right approach, she continued, “is not by obscuring those past injustices but by acknowledging them, confronting them, and giving back the capital that was stolen. We think [African Americans] have a right to it because they have been so consistently denied freedom. Emilio Valadez ’18 of San Antonio, Texas, and Angie Kemfack ’19 of Missouri City, Texas, perform with Sankofa, a student group that performs an original production each year on the evening of MLK Day. Sankofa explores the history and experiences of the African diaspora through performance, and this year’s show was titled Testimonies of Melanin Magic. 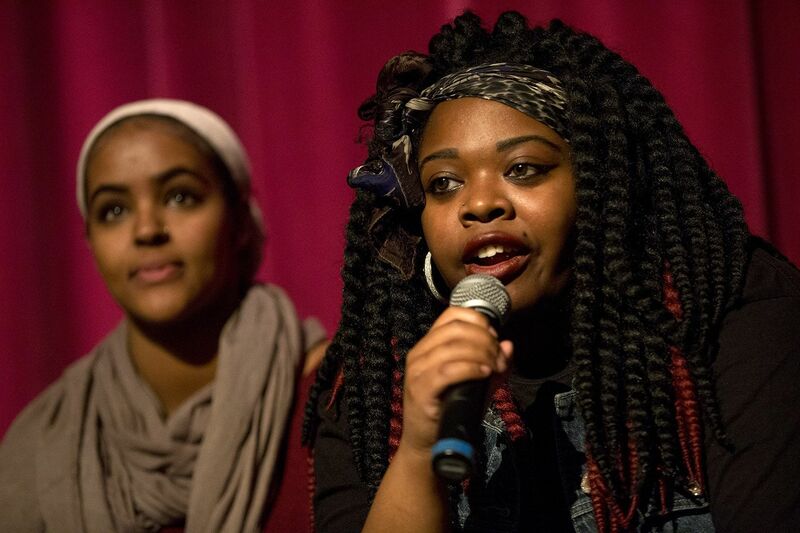 “The production was a means of voicing scenarios of common misconceptions of blackness and detailing how people representing the African diaspora cope with oppression,” said director Britiny Lee ’19 of Cleveland. Sankofa director Britiny Lee answers a question after the show. 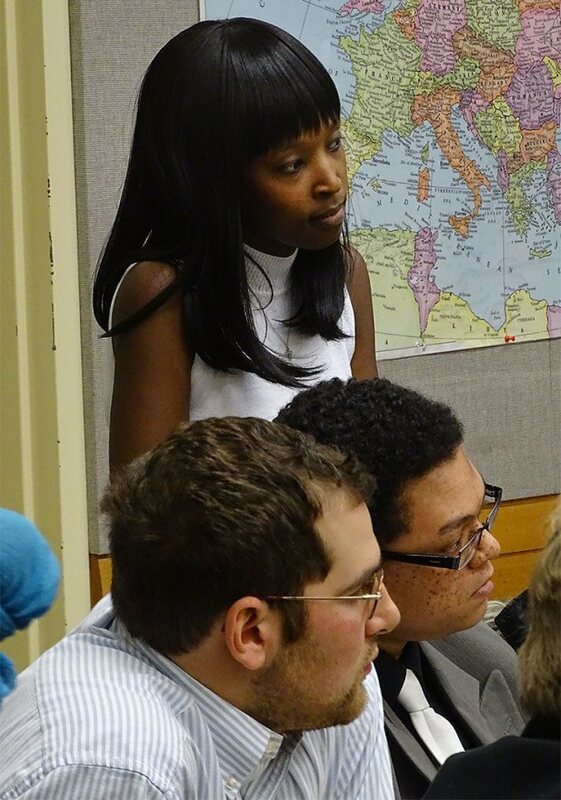 At left is assistant director Rakiya Mohamed ’18 of Auburn, Maine, one of last year’s co-directors. 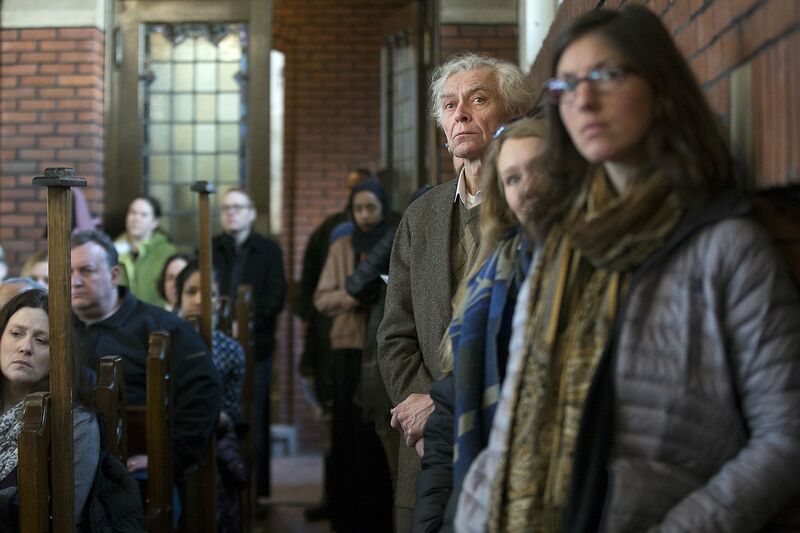 As his son, Associate Dean of Students James F. Reese, listens proudly, the Rev. 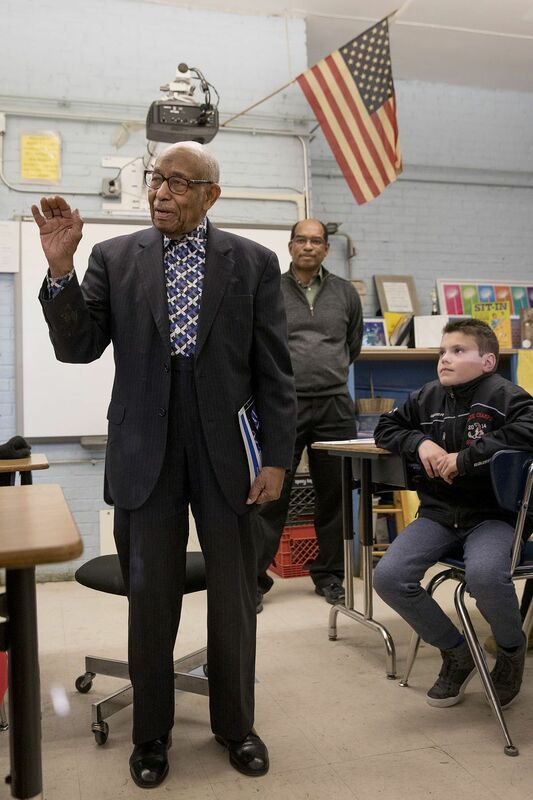 James F. Reese, age 93, tells sixth-graders at Martel Elementary School in Lewiston what it was like to meet Martin Luther King Jr. in 1960 and witness King’s “I Have a Dream” speech in 1963. While pastor of the First United Presbyterian Church at Knoxville College from 1959 to 1967, the elder Reese led sit-ins protesting Jim Crow laws and practices. Reese’s visit was part of the school’s annual MLK Day Read-In.